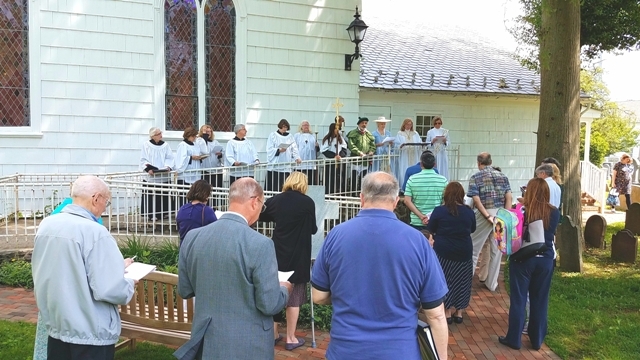 The parish held its annual Churchyard Memorial Service, including the Reading of the Names. The names of all veterans interred in the graveyard were read on Sunday, May 21st after the 10 a.m. service. These veterans span the eras from the French and Indian War to Vietnam. 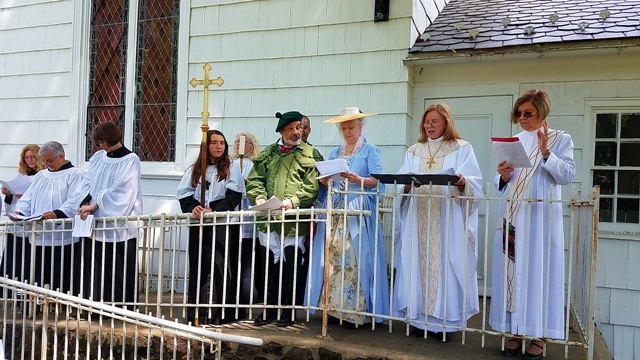 This event occurred about 11 a.m. in the churchyard at the southeast corner of the church. The veterans’ names were read by Judi and Stuart Buncher in costume. Stuart portrayed a sniper from the Revolutionary War. Colonel Cresaps Riflemen became the Maryland and Virginia Regiment consisting of 4 Maryland companies and 5 Virginia companies. They started in 1776 and ended in 1781. They were nicknamed Stephenson’s Rifle Regiment, Rawlin’s Regiment and Maryland Rifle Corp. To qualify for service each soldier had to hit a one foot by one foot wooden target three times at 200 yards with his PENNSYLVANIA RIFLE. The standard smoothbore battle musket was only accurate to 80 yards. They fought in the Battle of Monmouth. Judi portrays Sergeant Stuart’s wife.